My greens obsession is in full swing! In fact, I’ve finally had time for my garden to begin, and have planted rows and rows of healthy, nourishing greens. I can’t wait! The great thing is, my kids are almost as excited as I am. 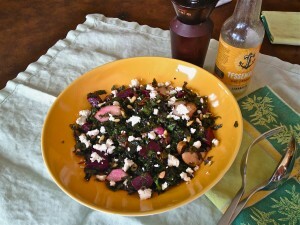 Today I was playing around with some new combinations of flavors and came up with a great Kale Salad. 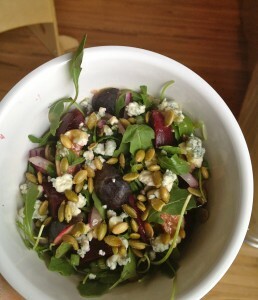 I’ve done a few, all with some delectable blends that are sure to nourish and enliven your palate! Prior to adding the beets, pear, and cheese, blend the first half of the ingredients, and add about 2 Tbs Olive oil, and a hefty squeeze of lemon. Take your time massaging the oil and lemon into the salad. Add course sea salt and pepper to taste and keep massaging. When the salad is tender the the touch, and the taste seems just right to you, add about 1/4 Cup Tessemae’s all Natural Lemonette Dressing. Then top with beets, pear, and Chèvre. A touch more salt and pepper if needed, and you’re all set for nourishing your body in a way that will also nourish your taste buds!